Avid fans and new readers alike will be captivated by WHEN FALCONS FALL: A Sebastian St. Cyr Mystery (Obsidian Mysteries; Hardcover; March 1, 2016; $25.95), the eleventh installment in the highly acclaimed series. Sebastian’s investigation takes on new urgency when he discovers that Emma was not the first, or even the second, beautiful young woman in the village to die under suspicious circumstances. Home to the eerie ruins of an ancient monastery, Ayleswick reveals itself to be a dark and dangerous place of secrets that have festered among the villagers for decades—and a violent past that may be connected to Sebastian’s own unsettling origins. And as he faces his most diabolical opponent ever, he is forced to consider what malevolence he’s willing to embrace in order to destroy a killer. Wowza! What a book! This is the first C.S. Harris book I've read and I was super impressed. There are a lot of characters in this book and it is quite fast-paced, so you'll really need to keep up, but it's worth it. Harris's attention to setting detail is pretty amazing. Her in-depth descriptions of the town and countryside create absolutely stunning mental pictures of the hauntingly beautiful Aylsewick and it's surrounding areas. Her writing style is intriguing and thorough, making this book a really exciting read. 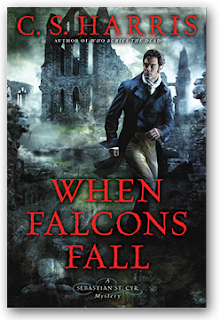 I love fiction that interweaves actual historical events and gives you a clear picture of the time period it's set in and When Falcons Fall exceeded my expectations:) If you are a fan of the historical mystery/thriller genre, you are likely to enjoy this novel as much as I did!